Hold daylight plate in the direction of a light source and look into the eyepiece. 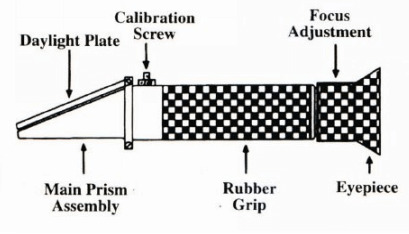 Look into the eyepiece and turn the Calibration Screw until the boundary between the upper blue field and the lower white field meet exactly on the zero scale, such as shown in the image. That is the end of the calibration process. Make sure the ambient room temperature is correct for the solution you are using(20℃/68 F).When working temperature of the room or environment (not the sample)changes by more than5 F, we recommend recalibrating to maintain accuracy. If the instrument is equipped with Automatic Temperature Compensation system, the ambient working temperature of the room must be 20℃ (68 F) whenever the instrument is recalibrated. Once calibrated, shifts in ambient temperature within the acceptable range(10℃-30℃) should not effect accuracy. Now place a few drops of the sample to be tested onto the main prism, close the daylight plate and check reading. Take the reading where the boundary line of blue and white cross the graduated scale. The scale will provide a direct reading of the concentration.